No matter your individual needs, AAB can help you. A lot of homeowners face the prospect of a bathroom remodeling project with a great deal of trepidation. They’ve heard horror stories of shady contractors, there is the fear of huge costs being incurred, and then there’s the hassle of having one of most important and functional rooms in the house being out of commission. These impressions are often reinforced by movies and TV shows, usually for comedic effect. All About Bathrooms goes to great lengths to prove to homeowners that such a nightmare situation is far from the norm. In fact, they will sit down with their client and show the many possible bathroom remodel benefits that can occur from such a project. The first of the possible bathroom remodel benefits is the most obvious one in that it can improve the value of one’s home. One of the most important features that prospective home buyers are looking for is the state of the bathrooms, particularly the master bathroom. It’s no surprise that many bathrooms become tired and faded over time. Fixtures and furniture are dated, and the tiles and textures are often decades old. A bathroom remodeling project can transform an eyesore of a bathroom into a modern wonder. Just like the kitchen, having up-to-date fixtures and a modern style can greatly enhance the selling price and help move the house that much quicker. 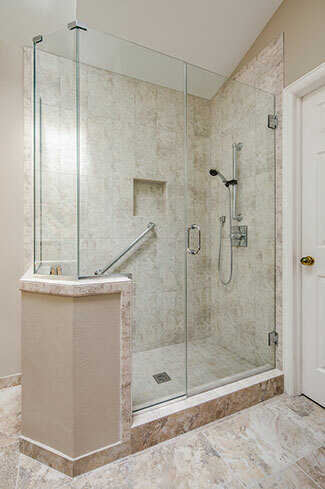 Another of the potential bathroom remodel benefits that an individual can enjoy is greater energy efficiency. Older toilets typically use a lot more water than their modern counterparts. The same is true for the humble shower head as the latest models feature stellar water pressure while using less water. The design experts at All About Bathrooms can show you a wide range of water-saving shower heads as well as low-flow faucets. Installing energy efficient fixtures can reduce water consumption in the bathroom by anywhere from 25% to 60%, which means lower water bills. Light fixtures and heaters can be replaced with energy efficient versions that can lower your electricity bill as well. Next on our list of possible bathroom remodel benefits is transforming the bathroom into the relaxing oasis of your dreams. In the past, most people viewed the bathroom in purely utilitarian terms. The goal of the bathroom was to do your business (shower, brush the teeth, etc.) as quickly as possible and get out. Now a lot of homeowners look at the bathroom as a source of relaxation where they can escape the hassles and drudgery of the real world. This can be as simple as changing the colors and textures used in the bathroom to create a more soothing environment, or it can entail the installation of luxury items such as a remote-controlled shower, heated tile floors, or a hot tub. A bathroom remodeling project can totally change the way you look at the bathroom. Instead of the bathroom being just a room where showering and other necessities are handled, it could become your very own personal spa where you can pamper yourself. One of the most important potential bathroom remodel benefits is the correction of something wrong. This is the case when a homeowner has issues with their bathroom, such as a cracked tub that is leaking, mold in the walls, broken floor tiles, soft spots in the floor, or electrical wiring that desperately needs to be brought up to code. As time goes on, the possibility of something breaking or becoming worn out increases. Some issues, such as mold and exposed wiring, can be very dangerous to those using the bathroom. Another casualty of a bathroom with problems is that comfort is greatly reduced. Who wants to use a shower where tiles are falling off the wall? A bathroom remodeling project can fix all the problem areas and once again make the throne room a comfortable and safe place. Freeing up more space is another of the bathroom remodel benefits that can be enjoyed by homeowners. The design experts at All About Bathrooms can show you a myriad of ways that space can be utilized to a greater extent. This can be done in a number of ways. The first is actually expanding the bathroom itself. This is a great option for those who have had their children leave the nest. Now that spare bedroom can be joined to the master bathroom in order to place a luxurious hot tub with an attached TV or a walk-in shower with seating. Another method of freeing up space in the bathroom is to use innovative fixtures and furniture. The addition of storage racks, open shelving, medicine cabinets, and wall storage can get rid of all the clutter that can plague a bathroom. Instead of fumbling through all the junk that used to be crammed on your countertop, you can open up a drawer or cabinet and instantly grab exactly what you need. A bathroom remodeling project can bring blessed organization and structure to the chaos of your old bathroom. As one can see, there are some great benefits for remodeling a bathroom, ranging from increasing the value of your home to freeing up more space to becoming more energy efficient. The possible benefits depend upon what you want from your bathroom, and the design experts at All About Bathrooms can help you achieve your goal. Everything from just updating the tired decor to a modern sensibility to a total bathroom makeover is possible. The end result is that you’ll have the bathroom that you want and whose benefits you can enjoy.